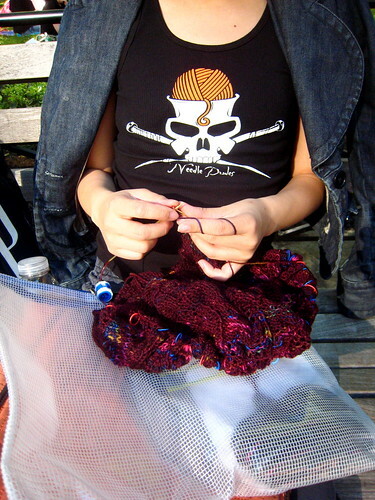 I know some people knit stuff and then never wear their finished objects, but I actually do wear most of mine a lot. I thought I would include a shot of something I made in action, so you can see how I actually wear stuff, not just when they’re styled for the blog, which tends to focus on the knitting, rather than how it looks in real life. 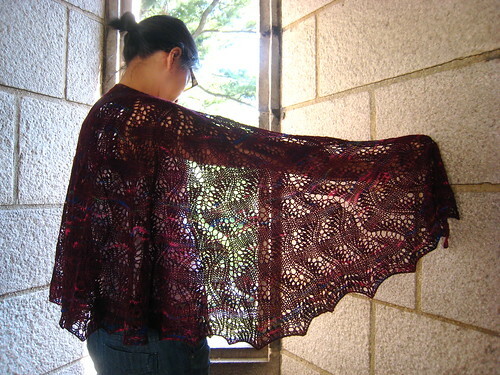 This is the Burgundy Bat Shawl from last year. I mainly kept it at the office as an in-between layer for the mysterious heat/air-conditioning battles, but now that I’m freelance, I’m trying to incorporate it more into my daily wardrobe. This was the weekend of street fairs–the official sign of the start of New York’s summer season. On Saturday, we walked up from 53rd to 82nd St., with a street fair along the way. Today, on 5th Avenue in Brooklyn, it was the exact same street fair, including the same ShamWow guy. One year, I bought this really cool chopping gadget–you put all your vegetables into a bowl, you spun the handle, and voila, all your vegetables were chopped! I haven’t seen that item at a street fair for a while though. Yesterday and today I only saw the usual meat-on-a-stick and strange undergarments. This scene, by the way, is not in the movie–but I think Spock’s mom is clutching something knit, with many many bobbles on it. I will say that there was a scene where Spock (the old Spock, not the younger Spock) had this awesome jacket that had a really neat hood that snapped around his neck and face that I wanted to copy. Anyway, knit long and prosper. 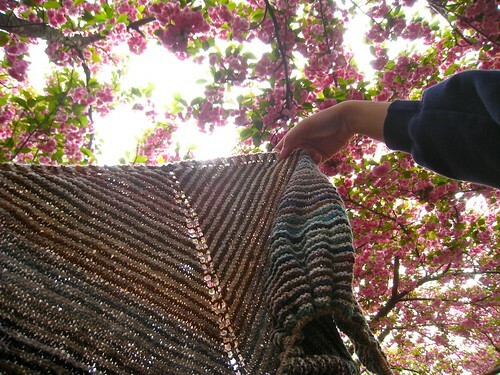 Posted in Shawls, travelingproject, Uncategorized at May 17th, 2009. 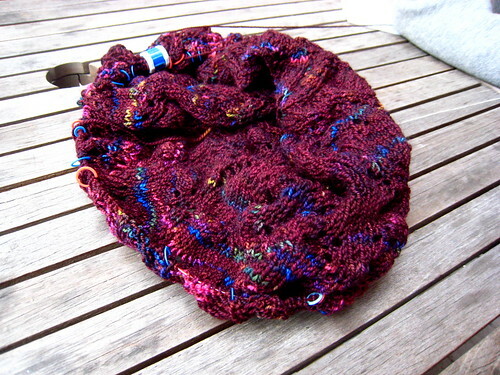 Posted in personal, Shawls, travelingproject, Uncategorized at May 2nd, 2009. 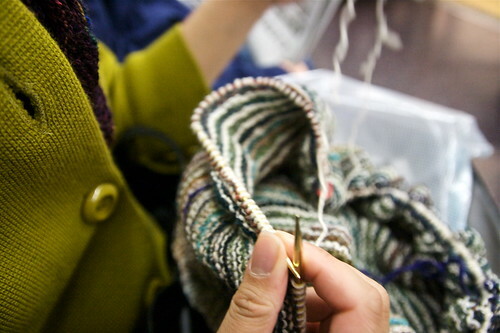 Last year, I took a class at Knitty City, on the Upper West Side, about how to read Japanese knitting patterns, but there’s a chance the book will end up being more of an inspiration, than line-by-line instructions for me. By the way, I noticed the prices here were significantly lower than the prices at Lacis, so if you’re interested in Japanese crafting books, this is the place to go. It’s also cherry blossom festival time at Japantown (and around the country, I assume), so here’s a shot of the shawlette in front of the cherry trees. Posted in Printed Matter, Shawls, travelingproject, Uncategorized at April 15th, 2009. 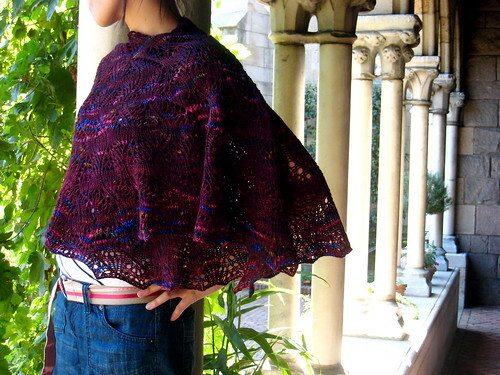 Pattern: Japanese feather and fan shawl from Izzy’s Knitting. 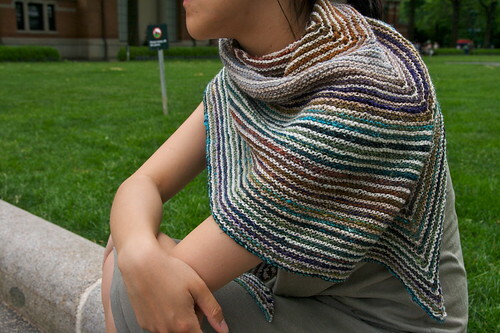 This stitch pattern is super-popular, and is also featured in the Baltic Sea Stole and Japanese Feather Stole. Yarn: Most of two skeins of Fleece Artist Merino Sock, $24 each , from Knitty City, thanks to a gift from Sarah and her mom. Thanks Sarah and Sarah’s Mom! 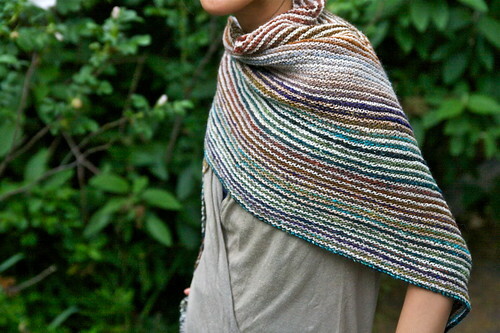 Their gift certificate has ended up being turned into two shawls, the Ella Shawl and this one. Project began/ended: Started April 28, finished July 11, or a little over two months. Notes and Modifications: I was a little worried about how the variegated yarn was going to turn out, and probably, if I could turn back time, (to quote Cher), I would have picked a semi-solid. I even contemplated overdying the whole project, but once it was blocked out, I think it was fine. An interesting experiment–and it definitely turned out better than I had expected when it was on the needles. 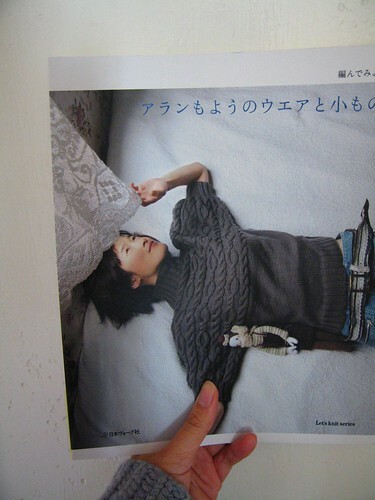 I knit the pattern exactly as written. It’s pretty clear, though lacking in direction. If you haven’t figured it out, you knit as written on the chart to the end (from right to left), knit the middle stitch as indicated, then knit back from left to right for the other half of the stitches, reversing the directions of the decreases (replacing the SSK with K2TOG and vice versa). 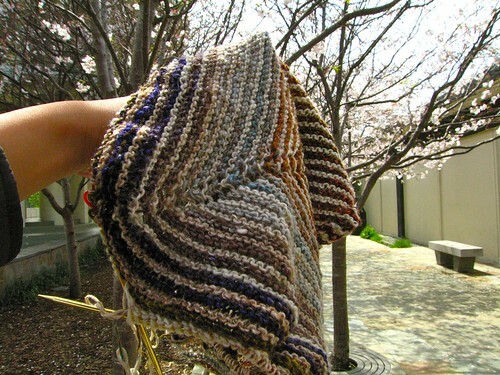 My edging didn’t really feather and fan, but no one else’s on Ravelry’s seemed to either. Click through after the jump to see more photos. 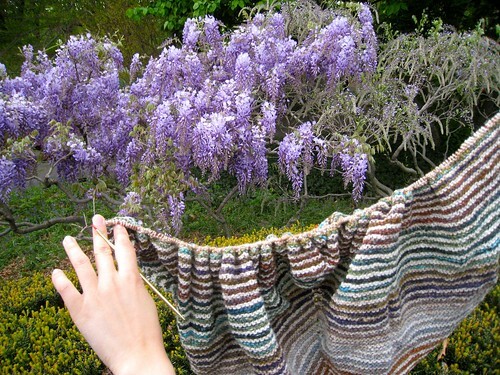 Posted in Finished Objects 2008, lace, Shawls, Uncategorized at July 15th, 2008. 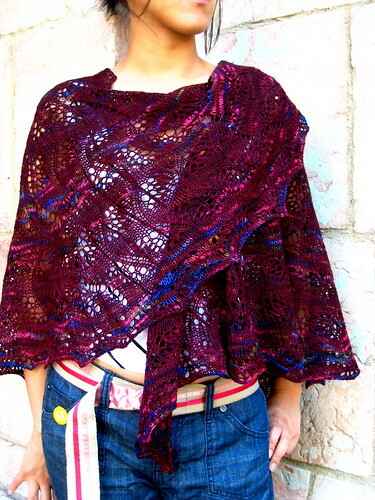 The shawl, it continues to grow. I’m a little worried I might have a stinker on my hands. When I bought the yarn, I was hestiating at Knitty City between a lace-weight Dream in Color in a wine color and this vareigated Fleece Artist yarn. The Dream in Color yarn was actually cheaper, yardage-wise, and a semi-solid. I had actually planned to buy a solid or a semi-solid color. But buoyed by the success of my other vareigated shawl, and lured by the splotches of hot pink in the Fleece Artist skeins, I bought the variegated. I fear that it may turn out looking like a ground-up Rainbow Brite doll, but even so, I’m going to wear it around, because it’s taken quite a lot of work to knit. Plus, I hate ripping. On another note, Adam and I were talking about how local yarn stores can compete with the internet, and he wondered if they had tried teaching knitting in schools, to breed future customers. I started laughing because I had recently read a David Sedaris article where he talked about visiting tobacco factories as a school field trip (complete with free cigarettes), and I remembered that a friend (and occasional commenter) had mentioned going to the local bread factory as a child. I don’t think we went to anything as super-branded as a tobacco factory as a field trip when I was kid (though I do remember visiting some television show which starred someone from Laugh-In, which was way before our time, and thus, not very impressive). It seems a bit intense to try to sell yarn (or tobacco) to kids through school, though I do remember during a crochet phase in my youth, sending away for some sort of yarn newsletter that came with sample cards on their newest yarn. (I have no idea how I found this company or their address, since this was years before the internet, though I suspect it may have been through this book I had, which had the addresses of many weird clubs kids could write to and ask for membership. I remember being particularly taken with the idea of joining a sugar-packet collectors club, which speaks highly of my coolness factor in elementary school.) 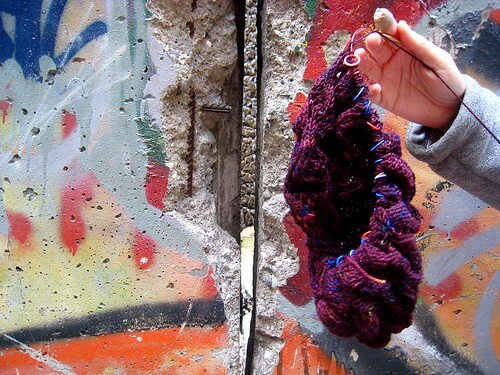 We had a sewing class in junior high, which required buying fabric, and I know many Waldorf schools teach their students to knit, so maybe knitting in the schools is a good way to create future customers. Posted in Shawls, Uncategorized at May 27th, 2008. 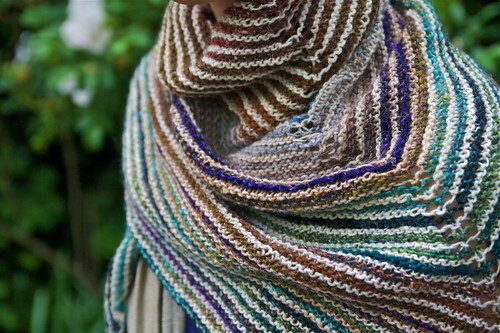 Posted in Shawls, travelingproject, Uncategorized at May 11th, 2008.